they are beautifully brilliant diamonds with matching faces. This is as simple necklace with a beautiful sequence of diamonds. The diamonds are graduated in size, from 4.6 millimeters in the center down to 2.3 millimeters at the ends. The clasp is also set with diamonds, forming an uninterrupted line. Carefully finished to lie smoothly on the neckline, this necklace is comfortable to wear. The diamonds in this necklace do not necessarily all have the same color and clarity grades, but they are all without defects and shine beautifully. These gem-quality diamonds with matching faces are carefully arranged by size so that they graduate smoothly. If even one diamond among these had a milky white color with low transparency, a poor brownish color, or a shallow cut that caused a “fish-eye” effect, the value of the necklace as a whole would be as good as gone. After all, no one would want to wear a defective product. While permissible to a degree in medium-grade pieces, the mixing in of materials that are not of the appropriate quality is a fatal defect for high-quality jewelry. In jewelry that is enjoyed for a continuous arrangement of gemstones, consistency of quality in the materials is of prime importance. 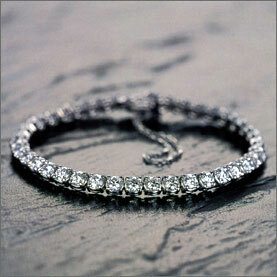 The bracelet below is a style called the “tennis” bracelet. Its name comes from the time when, in the late 1980s, the tennis player Chris Evert dropped a bracelet of this style that she was wearing on court during the U.S. Open. After that, this bracelet became popular throughout the United States, rapidly boosting the sluggish demand for 0.1-carat-sized round brilliant cut diamonds and reviving the diamond industry. Long ago, the masses copied the jewelry styles of royalty and nobility, but athletes and celebrities influence popular tastes in modern times.